I have been known to say that I like the ingredients in sweets to stay separate, as they were meant to be. For instance, I like chocolate and I like peanut butter, but I don't like peanut butter cups. I like cookies and I like munching on nuts, but please don't ruin my cookies by putting nuts into them. Weird? Maybe. But I typically just don't like when good things are mixed together because it somehow detracts from each one. In the case of Chex Mix Muddy Buddies, however? Combining a whole bunch of yummy flavors in one place ends up being absolutely delicious. A unique combination of Corn Chex cereal, peanut butter and chocolate that is then dusted with a powdery sweet coating, Chex Mix Muddy Buddies is the tasty snack that adults and kids have enjoyed for years. While some chefs pull out their mixing bowl, Chex Mix Muddy Buddies are available year-round in stores due to the popular demand from fans. Once you've tried this tasty and guilt-free treat (it is made with 50% less fat than regular potato chips) you'll want to have it on hand for your next party, picnic, snack time and more! ...and it didn't last long! The kids and I enjoyed munching on Chex Mix Muddy Buddies as is and my husband tried using it as a topping on ice cream and was thrilled with the outcome... and disappointed that he hadn't tried it sooner when the bag wasn't threateningly close to being empty. 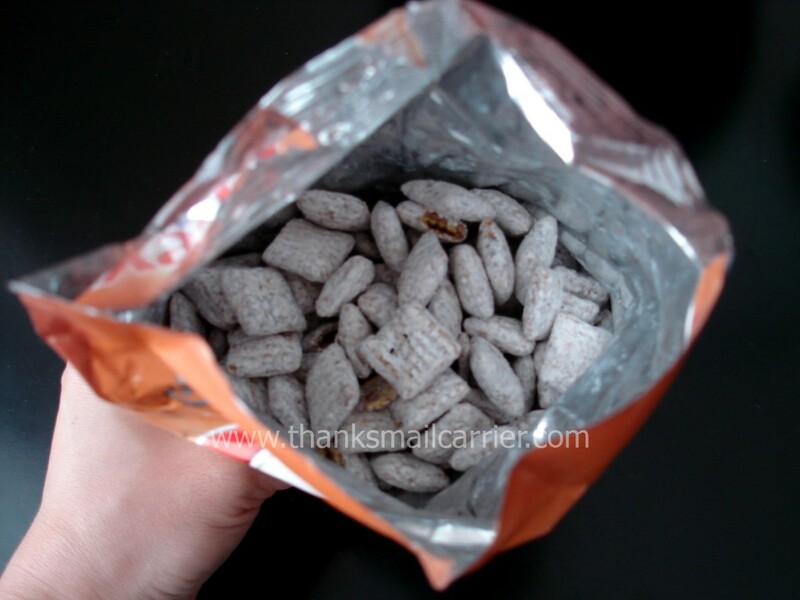 The next time you are at the store, keep an eye out for Chex Mix Muddy Buddies - you'll be glad that you did! You'll also want to check out the Chex Mix Facebook page and join in the conversation over there, as Chex Mix Muddy Buddies might not be available throughout the year if others hadn't shared the extent to how much they love it! One lucky person will win a Chex Mix Muddy Buddies Prize Pack that includes a bag of Chex Mix Muddy Buddies, an airtight sealed container, a snacking bowl, and a magnetic clip! To enter to win: Tell me the next occasion or event or day in which you would like to include Chex Mix Muddy Buddies now that it is available year-round. 1 Extra Entry if you Like Chex Mix on Facebook. Giveaway will end on July 28th at 11:59pm CST. Do me the favor of leaving an email address or making absolutely sure it is visible in your profile, I have to have a way to contact the winner. The winner will be chosen by random.org and announced here as well as emailed and will have 48 hours to contact me or respond to notification or a new winner will be chosen. This giveaway is open to U.S. residents only. 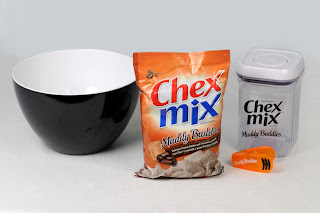 A big thank you to Chex Mix for providing a Chex Mix Muddy Buddies Prize Pack through MyBlogSpark for me to review as well as for one lucky giveaway winner. The opinions shared are my own and honest and if you really need to see more, click here to see how I roll. I will be getting together with other family members this summer and it would a great treat. Next occasion would be hubby's birthday - daughter & son-in-law will be here to celebrate with us. I would like them for our family movie night. This would go good with all the BBQ's were are having with the family! We like to have treats when we watch a really good movie or ppv program so we'd probably use it for one of those occasions. I like ChexMex on Facebook. YUM! I would like to have them for dinner tonight. LOL! I entered the Go Anywhere Booster Seat Review & Giveaway. I entered the Go Anywhere Booster Seat. I'd like to serve it at my next pool party! I Like Chex Mix on Facebook. This would be great for our guest at my Son's Birthday party in a few weeks! I like Chex Mix on FB! I'd lile to bring it to the next food day at work! This would be the perfect snack to have while were hanging out at the pool with family this summer! Lol...i would just like to eat it while blogging, and hanging out! Sounds Delish. we have movie night, most mondays, and i'd serve the chex muddy buddy mix then instead of our regular popcorn! i follow you on twitter @ntiveheart and tweeted!! These would be great at my nephew's birthday party this month! would be great at my daughter's birthday party! I also get your emails, love to have Chex mix anytime! Like you on FB ,and Chex mix to, can't wait to try it! I'd like them as a snack to bring to work. http://twitter.com/#!/SchroederMommy/status/89068494066425856 and I follow you! We'd eat them for snack on weekends when we are camping. Thanks. Like Chex Mix on Facebook.